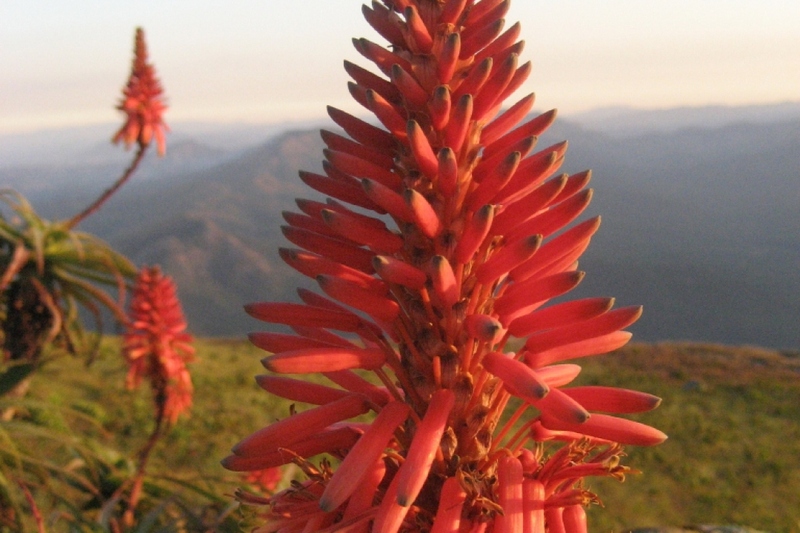 Dear-Horn Cactus (Aloe arborescens): growing, planting, caring. A large Aloe, sometimes grown as a houseplant. 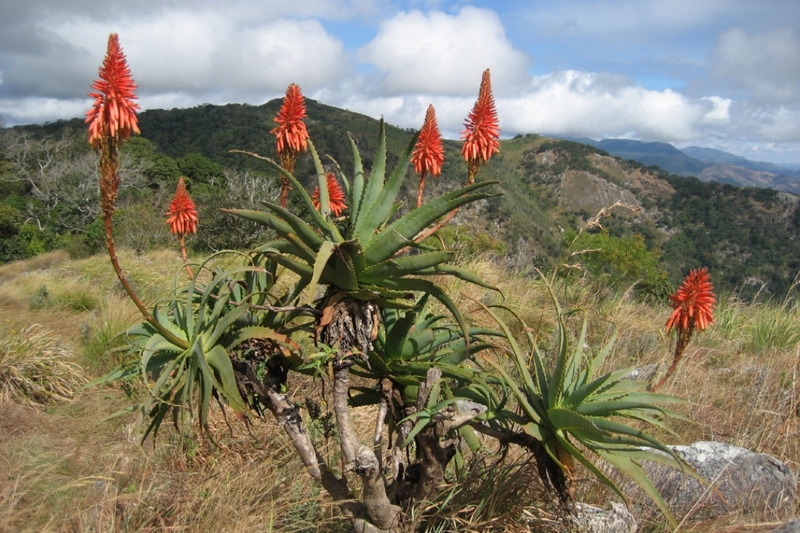 Aloe arborescens is a shrub reaching 2 to 3 m in height, with sessile leaves arranged in a rosette at the end of the stems - a bit like a yucca. The leaf blade is lanceolate in shape, 60 cm long and 5 cm wide. The flowers are red, in erect clusters. Aloe vera is a succulent with shallow roots, it never loses it leaves, and it grows in small groups or even colonies, because of it's skill at putting out suckers. The stem is a short, woody base that holds alternating, distichous leaves, set into each other. This is most common for young plants, as they age into rosettes. Typically a mild climate plant, aloe vera adapts especially well to the interiors of our homes and apartments. It develops well between temperatures of 18-22°C (slightly cooler in winter, if possible), and it needs light. Be careful nonetheless. Avoid placing the plant directly behind a window with too much sun exposure! It is possible to keep your aloe vera outdoors, in partial shade, if the temperatures in your area don't dip below the fatal zero. Otherwise, keep it inside! 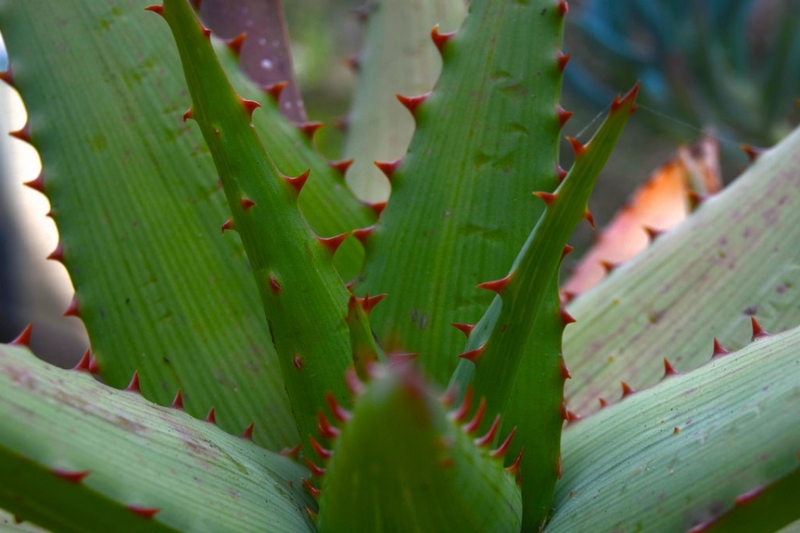 Aloes don't like humidity, and their water needs are pretty limited — they stores everything they needs inside their thick leaves! During growth seasons (spring, summer), watering should be regular, about once or twice a month, but make sure the roots don't rot. In autumn, gradually reduce watering until winter, when once-monthly watering will suffice. Use soft (non-chalky) water, closer to room temperature and not cold, as a significant temperature drop can cause serious stress to your plant. In dry weather, spray your plant with soft water, clean the dust on the leaves: it will be all the more beautiful! Never! Aloe vera like poor soil, really! Every 3 or 4 years, at the end of winter, transplant your aloe carefully to a slightly larger pot than it's current, adding a mixture of sand, topsoil and garden soil. Cover the rood nodule, but don't let the leaves touch the ground. Position the root nodule of your aloe vera just above the soil! Don't water for the first few days after repotting — roots damage by watering increases the odds of rotten roots. Wait a few days and water lightly the first couple times. Aloe very often produces lateral shoots: they are the ones you will use to obtain new plants ... These new shoots often appear when the "mother plant" feels cramped in its pot! They tend to be slightly greener than the leaves of the adult plant and do not have the same thorny edges on their leaves as they emerge for the first time. When one of these shoots reaches 7 to 10 centimeters, remove the soil at its base to see if it is attached to the mother plant. If it is the case, cut its base with a well sharpened and sterilized knife, making sure that the young plant remains attached to its roots. Let it dry for a few days until a "callus" appears - it's a small bulge - at its base, normally within a few days. Plant the young shoot in its own container in a well-drained soil without burying the leaves. As the root knot is likely to be small or nonexistent, you will probably need to support the shoot with a layer of pebbles and press it against another object. The root system should become strong enough to support the new plant in a few weeks! Water after a few days, gently! 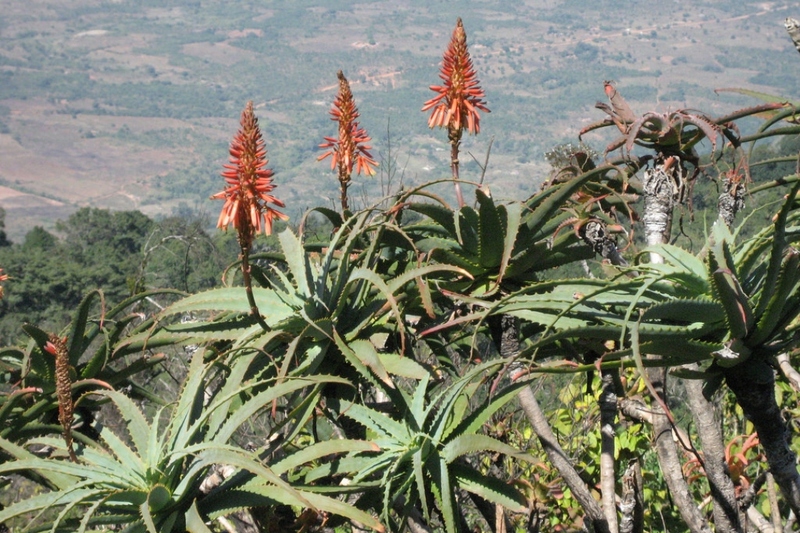 The leaves of Aloe aristata must grow upward or outward towards the sunlight. If they go towards the ground or they grow flat outward, it is because the plant probably does not get enough sun. Move it to a sunny spot. If it's inside, think about letting him out during the day! Conversely, if the leaves turn brown, reduce exposure to the sun. If the leaves are thin and curly, increase the watering! And if the leaves turn yellow or sag, stop watering. Yellowing or "crumbling" leaves suffer from excess water. 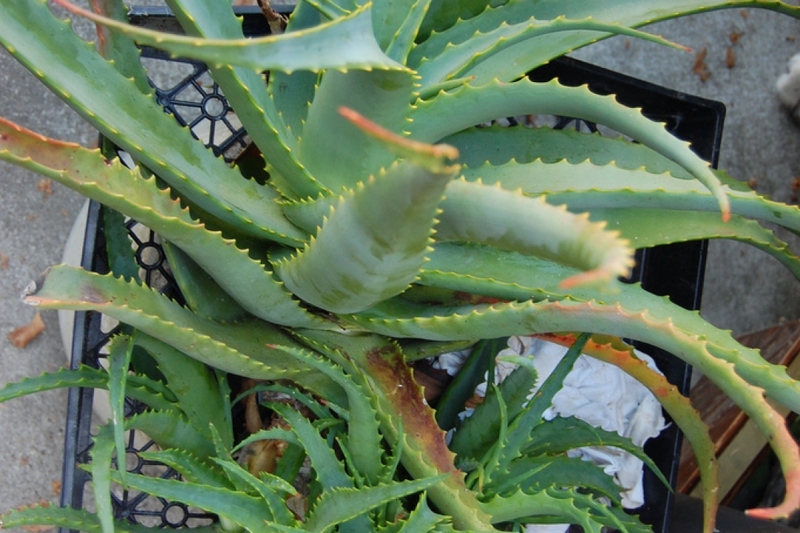 Aloe aristata is not very sensitive to diseases, except when there is to much water. It can then be attacked by mealybugs or kermes, mildew or thrips. Mealybugs are sucking biting insects covered with a sort of waxy or powdery shell. If the leaves become sticky and become covered with sooty mold and the infected parts of the plant dry up, spray rapeseed oil to smother them. Thrips is a small, 1 to 2 mm pitting insect that appears in hot, dry weather, much like red spiders. A spray of water slightly soaped on the leaves at the first outbreaks may contain it. In all cases, check the frequency of your watering, and the moisture of the room. Feel free to take your aloe outside for the summer! Avoid simply plopping it down in full sun; let it acclimatize slowly and, of course, keep an eye of watering! Take it inside at the end of the summer. Bring in your aloe vera before the first chilly nights, ideally in a cool room so it still "feels" winter — a good, cool winter period between 5 to 10°C at night without artificial light is perfect. Water at least once a month in winter.